Cleaning out gutters may not seem to be an important task but we know from experience that blocked gutters can lead to heavy rain being diverted and end up flooding buildings such as factories, retail parks. This can cost thousands of pounds in lost stock, fixtures and fittings, lost production let alone being a safety risk. As we all know, water and electricity are not a great combination. Cleaning the gutters is a job that needs to be done regularly to ensure the safety of your premises particularly where a property is near trees and where there are a lot of birds such as sea gulls, pigeons etc. 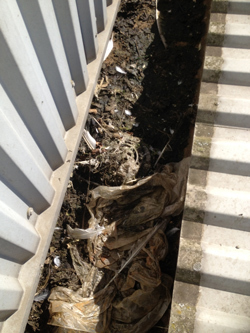 The picture opposite shows the gutters in a retail park that did not have a regular gutter cleaning regime. When a sudden downpour filled the gutters the water then ran down the walls on the inside of a major electrical retailer, a sportswear company and a car accessories company causing huge disruption, damage and large insurance claims. If you have not had your gutters cleaned for some time we would be delighted to discuss your need with you and if appropriate, offer you a cleaning and maintenance programme that will give you peace of mind.